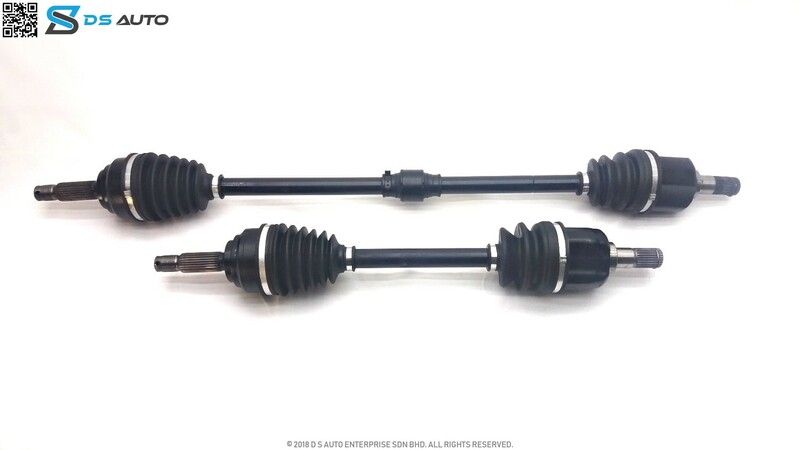 This is Proton Waja drive shaft set, showcasing both the drive shafts from the side view. This is Proton Waja drive shaft set from the top view. 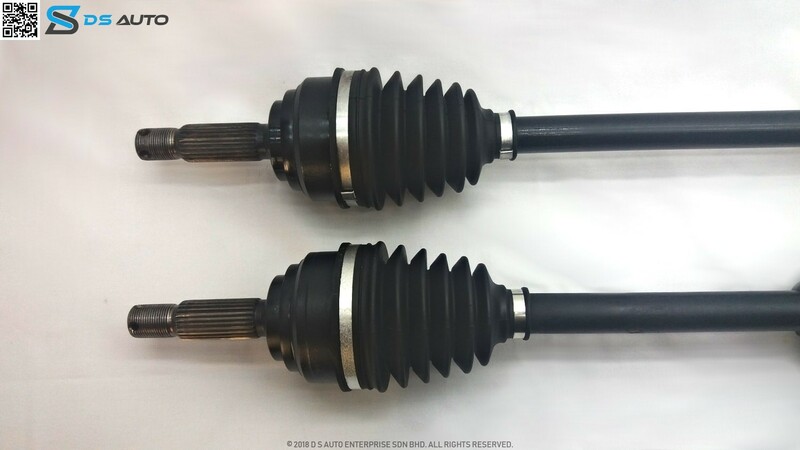 This is Proton Waja drive shaft set, showcasing the outer constant velocity joint. 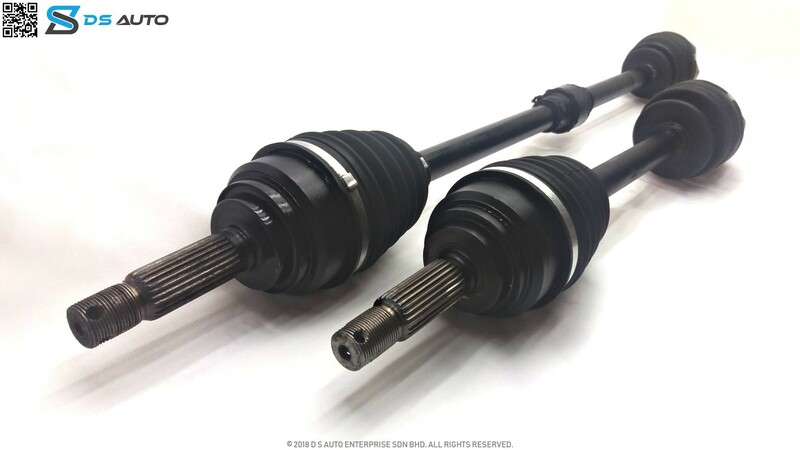 This is Proton Waja drive shaft set, showcasing the inner constant velocity joint. Is your Proton Waja giving you problems? Looking to get your drive shaft replaced? 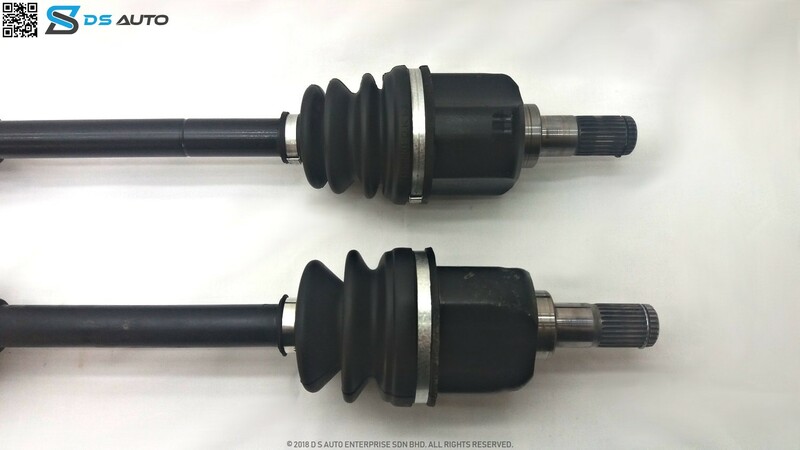 Speak to D S Auto‘s customer service now to get your Proton Waja drive shaft. The Proton Waja is a car made by a Malaysian automotive company, Proton. It was Proton’s first in-house designed model although it is based on the platform of a Mitsubishi model (Carisma model). The Proton Waja is a 4-doors C-segment saloon car. The body layout is front-engine, front-wheel drive. The Proton Waja was launched in August 2000 and production lasted till 2011. Proton’s new corporate logo was also introduced at the launch. The first batches came with fabric seats only, no ABS and no airbags. The Proton Waja was powered by a 1.6-litre 4G18 SOHC MPI petrol engine sourced from Mitsubishi and mated to either a 5-speed manual or 4-speed automatic transmission. Proton launched the Waja 1.6X in October 2001 only available with an automatic transmission. The Waja 1.6X came with more luxurious items like full leather seats, rear seats adjustable headrest and lumbar support for driver seats, door trim, a semi-automatic air conditioning system, driver’s ABS and Electronic Brake Force Distribution (EBD), auto flip mirror and a semi wooden steering wheel. The audio system came with a built-in CD player and six-disc CD changer. Proton launched the Waja 1.8X in 2002 powered by the Renault F4P engine and it shared similar equipment with the Proton Waja 1.6X. But it this variant had a passenger airbag and larger front discs brakes which were absent in the Waja 1.6X. Another variant of the Waja was the Proton Chancellor which was released in 2005. This variant came with a longer wheelbase and a 2.0 liter Mitsubishi 6A12 V6 engine. It was only available with a four-speed automatic transmission. The Proton Waja got an update in 2006. It now had the Campro S4PH engine, redesigned air-condition vents and a new CD player with MP3 support. In mid-2006, the Proton Waja got an update to its exterior. It got new headlamps, new rear taillights, and new alloy wheels. The 125 PS (92 kW) Cam Pro CPS engine was added to the vehicle in 2008. Additionally, the exterior got a new grille and tail lights. The 2008 Waja CPS also had both ABS and airbag as the standard required by the Malaysian market. These were previously optional equipment for this market. 5-speed manual, 4-speed automatic transmission. Power windows and remote central locking. How much did the Proton Waja cost? As of 2007, the prices of the face lift was around RM59,400 for the 1.6-litre manual transmission and RM62,900 for the automatic transmission version. By June of 2001, more than 26,000 units of the Waja were sold. As a result, between a 2 year period (200-2012) more 290,000 Proton Wajas were sold. The Proton Waja’s major competitors were the Kia Spectra and Honda Civic 1.7. The car came at a good price. Users found the car comfortable to drive. Only a few users reported engine dying off when idle sometimes but maintenance was easy and spare parts were likewise easy to fond.